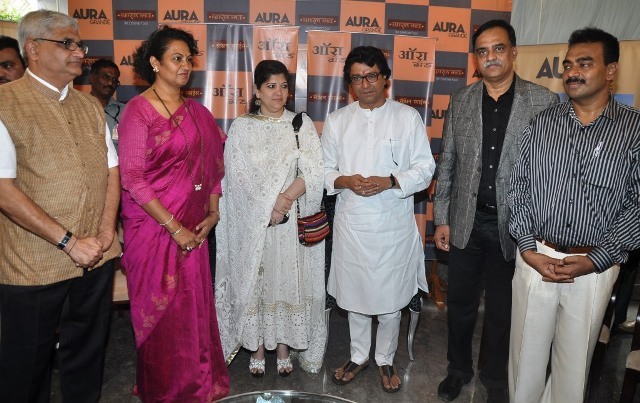 After the immense success and overwhelming response, since 2003, for Saffron Spice Restaurant and MIDC Andheri, the group saw the launch of The Aura Grande Hotel; by the parent company Annakoot Properties Ltd.
Gracing the event with their presence were Mr. Raj Thackeray, Founder President of the Maharashtra Navnirman Sena along with his wife Mrs. Sharmila Thackeray who inaugurated the business hotel, witnessed by an enthusiastic gathering. The event was set in motion when Mr. Thackeray and his wife cut the ribbon and lit the ceremonial lamp, ushering in a new beginning for the hotel. Mr. Thackeray enthusiastically interacted with the audience, while enjoying a tour of the hotel’s infrastructure and various facilities along with the Owners Mr. Nandkumar Hendre, Mr. Pramod Hendre, Mrs. Supriya Joshi and Mr. Suhas Joshi. Labels: annakoot properties, hotel auro grande, raj thackeray, sharmila thackeray.